Xivambalana giving a royal walk by! Many of you might have heard I was visiting Djuma for a couple of days from the 24th until the 26th and I must admit I was so excited to see our favourite lady and her family, they must have sensed how much I needed to see them! As I was driving over to Vuyatela, her image popped into my head and I wondered if I would be lucky enough to touch base with her over the next couple of days. I was extremely hopeful as it had only been 3 days since she was last seen and the day was overcast which could encourage the spotted felines out from hiding! 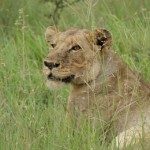 It has been just over 2 weeks or so since Xivindzi has been seen; but it sounds like she is doing well as we expected. Highly independent at only 17 months old it is such a huge contrast to her brother! As soon as I announced on the radio I had departed for game drive, the call came in Xivambalana was on the western side of Inga’s house on the quarantine open area. Thrilled to hear this news, I immediately became like a child again, a huge grin spread across my face as I bounced down to the sighting! He couldn’t have been in a better position, lounging on the branch of the old marula tree we have watched ground hornbill foraging for food around and seen the Gowrie gang sitting on countless times in the middle of the quarantine eyeing the impala at least 90m away. Instantly I could see how much he has grown, he is about the same size Mixo was at his age and just as handsome as his elder sibling! Xivambalana lounging about before his hunt! He was not in the slightest bit concerned at the vehicles being there either, which was so heart-warming to witness, it is clear he is maturing and it was wonderful to see how he was more sure of himself and his surroundings. I sat with him for a while, but he became restless as he kept looking over at the mobile buffet tantalising him. Xivambalana focused on what lies ahead! Eventually it got too much to handle and he made his descent back to suitable cover, it was at this moment to my amazement Karula suddenly appeared from underneath the fallen tree. She must have been taking a break while Xivambalana made use of the vantage point! Together mother and son crept in unison towards the antelope, focused on the shared goal. Maybe Xivambalana was a little too eager or the wind turned but they were not even within striking distant before the alarm was raised. You could see on Karula’s face she was not impressed, but to her son, the call to tell them it was a waste of time fell on deaf ears as he tried in earnest to get closer. Eventually he realised the females were too alert so shifted his attention towards two males sparing who were not taking notice of the alarm calls. He literally leopard crawled into long grass, but the females became so instant about him approaching, the males took their dispute further away from the danger zone! This still didn’t dissuade him from approaching; he merely stood up with his white flag in full view and strolled across the open ground to settle next to a bush, still watching for a potential mistake from his quarry. Once again Karula appeared to check on her son’s progress and assessing the situation, which became clear she was not in favour of his choice. She gave us a royal walk by in her usual fashion as she moved to get a better look! Karula less than 2m from us! He took a moment to regroup and noticed a lone ram south of where the rest of the herd were. He had lost interest in the commotion and was busy displaying; a perfect opportunity to take advantage of. Unfortunately there was a lot of ground to cover but Xivambalana was not fazed. He took to the cover and made his approach as Karula watched his attempt. The ram was not as clueless as he thought, yet again the alarm call sounded and the score became 3:0 to the impala. Game well and truly over for Xivambalana …or is it?! Light was fading rapidly as he retreated to more comfortable spot while the ram continued to sound the alarm. Even after all this I have to hand it to him he didn’t give up. From his view point he spied another potential meal and headed for the nearest cover. I actually think he could have been in with a chance as another ram came close to where he hid, but his scent gave his presence away. Already on high alert, the ram started to call, but it became clear he didn’t know where Xivambalana was hiding. I held my breath as he came within a few meters of our young hunter, still looking towards where the last male had been calling from, almost confused at not seeing a cat there. He was within striking distance but Xivambalana hesitated and immediately the ram spun round to stare right at him. With only a few meters between them, Xivambalana still launched into half-hearted pounce and gave chase for all of 2 steps before finally conceding defeat! At 4:0 it looked like enough was enough for our young leopard, at least for the time being! Karula had headed further West, possibly waiting for night fall before she made any attempt at catching dinner, but it had been brilliant to see her and to witness such a change in Xivambalana. I always knew he had it in him! If this wasn’t enough we bumped into Induna the following afternoon as he took a stroll and scent marked close to Gowrie gate on the Eastern side. The following morning we were lucky enough to catch up with him on Buffleshoek cutline where he was voicing his concern for something. He gave a small contact call mixed in with his growling. As we drove around we could hear another leopard who turned out to be Yambilu-Jordaan voicing his opinion that his son was not allowed to share his kill this time! Induna took the hint and melted back into the bush with out so much as a goodbye. Could this be the turning point in their relationship? He is 3 and a half years old now, time to stand on his own 4 feet! But who knows, maybe his father was just in a bad mood!! All I know was it was great the royal family of Djuma graced us with a snap shot of how they are doing! Enquire as to our Introductory Special at the new Vuyatela! 24 Responses to What a royal welcome! I too miss the drives. What can be done to get them back? I keep playing the lottery in hopes of winning big so I could help pay for the return safari’s. Thank you, Tara, for the wonderful update complete with photos! I’m so happy you were able to see so many of Karula and her offspring. Thanks for posting these wonderful pictures!! Yes, we really DO miss the drives. My hubby watched them faithfully! Thank you so much Tara. It means so much to us. All of us miss you terribly. Always excited to hear from you. TC. Many hugs. What a fantastic experience for you Tara, and you passed it on to us like we were there.. thank you for that because we all miss the drives so much. I am totally lost without them and miss all you. But pleased you came back for a brief visit and look what happened!! So it isn’t just the viewers who need you back, is it? LOL Take care where ever you are. Thanks so much for the update Tara! I still miss the drives so much. Good to hear from you and we all miss you guys! So wonderful to hear about your wonderful sightings, and see the lovely photos. I can’t thank you enough for your wonderful re-count of your day with the royal family. You are great at telling a story. Shame we have to wait for you to visit before we can hear/see anything of the animals we grew to love. So happy you think of us while you are there. You are missed by all. Thank You so much Tara. It was great to see your pictures and the update on our Royal Family. The Djuma Email is always the first to be opened. I miss the drives very much. Is there any possibility they will be returning? Can you let us know what you and Marc are doing? Love you all. Hello Tara welcome back to Djuma, thank you for the brilliant blog, great to hear of Karula’s family, sounds as if the young boy of Karula still depends on mum, but he is trying his best he will get there evently. on drive more than I can say, and I miss you and Marc and all the animals so much, too. Like the others, your e-mail is the first opened and read over and over. It is a pleasure to read your detailed narrative and enjoy the beautiful pictures of our lady and her cubs. I don’t think I’ll ever get over missing the drives. Thank you for sharing your time with them. Your passion is contagious. 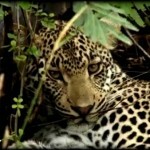 Tara, it was wonderful that you got to take a drive, and was rewarded with the Royal Family of Djuma. They are so beautiful, as are the memories we have of all of them. Thank you for posting your story. You should consider writing as a side career. You are very good at it. Still miss our Ponytail Gang. Ditto to all comments above. Thanks for the pictures and narrative. Miss the drives and esp. You presenters! Good to read such a lively report from you Tara. Vuyatela! Tara, thank you so much for the pictures and stories. I have to admit I burst into tears when I saw Induna. He has always had a special place in my heart. I never could stop marveling at how lucky we were to have the technology to bring South Africa half way around the world and into my livingroom. I had just bought a tabllet so I could take you all with me whereever I went just about the time of the announcement that there would be no more drives. And then the storm that did so much damage was so heart breaking. Sad Sad Sad. I love your postings and stories of seeing all of our beloved animals. My best to you and all you do in the future and I hope it will include the Djuma updates. Hugs, Judy Dearing AKA Gatormom. PS…Do you hear from Marc? How is he doing? Just watched a documentary about white lions set in Timbavati! Thought of Marc. times we shared on the drives! Again, thank you and please, don’t forget and I’ll always look back to those special times with all of the Djuma experiences! Take care and miss you! Thanks so much, Tara, for your updates and the pictures. We miss you, Marc, Seb and the gang so much; we were like school children learning with each drive along with enjoying it tremendously. Now, we are always anxiously waiting for the next one! Tara, only you and a few others know how we yearn for reports on karula and her family. I can only imagine how it makes you feel to step back in time where we all spent so many hours together. I hope you are happy with your new position…sounds wonderful…but I am glad you take us back to where it all started for me. Any sitings of the Gowrie Gang, no one tells us much about them anymore…thank you Tara, we miss you and our past together, but adventures must go on, God’s speed to you…hope to one day cross paths.